Heart Woodfire Kitchen | The Sassy Spoon: Fun Food! Tucked away off of Folly Road on James Island, Heart Woodfire Kitchen is a very special place. It is fun and hip and the first thing that hits you when you open the door is the sweet deep aroma of wood burning. This touches me tenderly, as I once owned a wood burning oven at my cooking school in Chicago and I miss it so much. The very core of this place is the Valoriani wood burning oven and a wood fired rotisserie grill. It does not stop there. Clever cocktails, local produce, pork and chicken raised in the Low Country, nice wine and beer selections and a creative upscale menu without being pretentious. This is not fast food, not BBQ and not white tablecloth dining, it is great flavorful dining at the mid price level, something we do not have a lot of in Charleston. We went on a Tuesday night after going to see a film. It was balmy outside, so we opted for outside dining. The restaurant was unusually busy for a Tuesday and it was obvious that this was a bit unexpected for the staff. The assistant manager became our server because they were short staffed and we were very lucky because she was on top of her game and gave us second glasses of wine on the house because the kitchen was jammed. The food was excellent. Full of smoky flavor and interesting textures. We started with a small order of one of their “Speidie,” little skewers. cooked close to the flame. 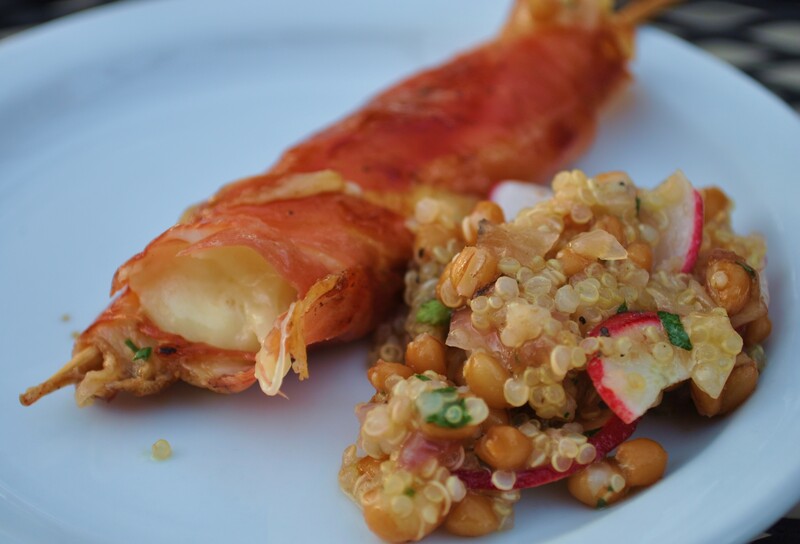 We had the Fontina wrapped in prosciutto & balsamic with a wheat berry salad. 2 skewers for just $6, quite the perfect thing to nibble on while you are drinking one of their fabulous cocktails. They offer two other Speidie, one with Beef Short ribs, rosemary oil & almonds and another with Bacon wrapped Chicken Livers & chimichurri. The menu has several other small plates including some interesting soups& salads that change with the seasons. 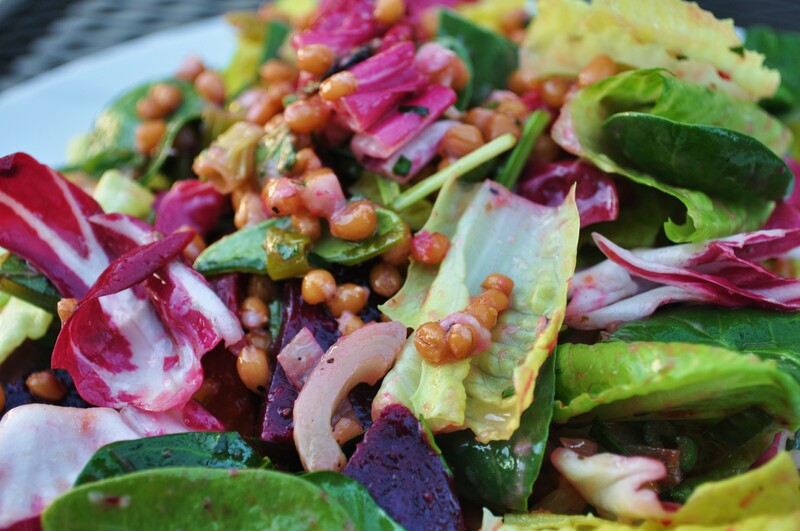 We shared a spinach salad with roasted beets, wheat berries, romaine,onions and a green garlic vinaigrette. It was crisp and yet warming with the roasted beets. The green garlic vinaigrette was perfect. I would have liked a little piece of their fabulous house made bread to go with it. My husband ordered the blackened catfish sandwich which comes on one of their sturdy house made rolls. It was round and he was expecting more of a poor boy style bread, but the flavors were fabulous and the fish was crusty with spices on the exterior and warm, tender and white on the interior, just as it should be. He ordered creamed mustard greens as his side and they were stellar. I had a few bites and we brought the rest home because after a bag of popcorn at the movies we were fuller than we thought we were. I had one of their signature flat breads, really a crispy little pizza. 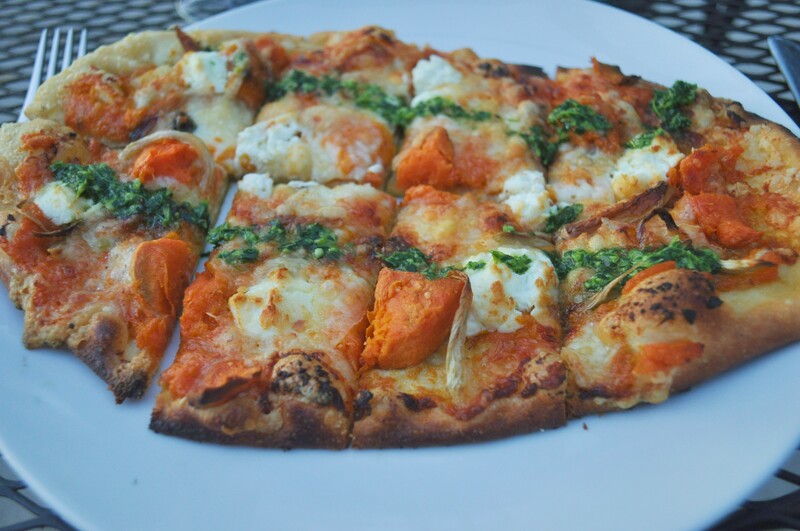 I opted for the vegetable flat bread with Acorn Squash & Goat Cheese, fennel, cauliflower & arugula pesto.I bought some home and will be having it for lunch today. We are looking forward to going back and trying some of their local fish from the wood fired oven. We also saw dishes of their baked pasta with four cheeses walk past us and they looked delicious. Their rotisserie chicken looked fantastic and I can only imagine that their Grilled Butcher’s Steak with roasted mushrooms & onions, herb butter is fantastic. The Wood Fired Vegetable Stew, basmati rice, basil pesto, lemon yogurt, toasted almonds & apricots also sounds interesting to me. They have an extensive lunch menu and what looks like a fun brunch menu. They have happy hour from 4-6 and the offerings are a good way to taste several things at a reduced price.